New, Custom-Finished Purcellville, VA Home – Move in by Fall. PURCELLVILLE, VA — This quaint little 18th century town situated in the heart of northern Virginia’s scenic wine country has emerged as one of the region’s most sought after locations for its natural beauty, relaxed pace, and exceptional quality of life. 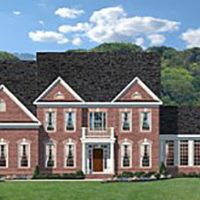 It was the obvious choice for our new, luxury, Loudoun Oaks community on Silcott Springs Rd. Now, our first Loudoun Oaks home, a stunning 4-bedroom, 4-1/2 bath Cypress model, is nearing completion. This 3-car garage residence with handsome brick front is an exquisite 5833 finished sq. feet. We’ve included a light-filled morning room off the kitchen. The expanded family room showcases a stone-faced gas fireplace and magnificent coffered ceiling. The lower level features a fully-finished rec room, a media room and full bath. There are custom moldings, upgraded stainless steel appliances and a host of other custom options already designed in to the home. 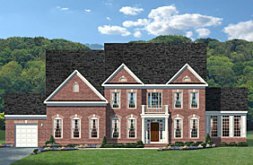 For those families who know Purcellville and appreciate custom quality living by CarrHomes, there is also the opportunity to choose whatever finishes you want for a limited period of time.